Drogon Chogyal Phagpa’s father was Sangtsa Sonam Gyaltsen, who was the younger brother of Sakya Pandita. Sonam Gyaltsen had five consorts, the first of whom was named Machig Kunchid from Tsanadap. Her eldest son was Drogon Chogyal Phagpa. Chogyal Phagpa was born at Namring Lukhung in the year of the Female Wood Sheep on the sixth day of the third lunar month. At that time, his father, Sonam Gyaltsen was fifty-two years old. At the times of Chogyal Phagpa’s conception and birth, many auspicious signs appeared. While he was still very young, even without being taught, he had great natural knowledge of reading and writing in diverse scripts. He also learned other subjects without difficulty. From a young age Chogyal Phagpa also possessed clairvoyance and the ability to clearly recall his previous incarnations. For example, when the moment came to determine if he was, as suspected, the reincarnation of the famous teacher known as Saton Ripa, two of Saton’s disciples went to see him. At the time, Chogyal Phagpa was playing games with other children, but when he saw the two monks approaching, he said, “So you have come at last?” They said, “Do you recognize us?”, and he replied, “Of course.” And he named each of them correctly. This so dispelled their doubts and inspired them with great devotion that they prostrated to him. Chogyal Phagpa’s father, Sangtsa Sonam Gyaltsen, was a great practitioner who concentrated on Ganapati practice. At one point Ganapati appeared before him and lifted him up into space to the height of a mountaintop, saying: “Look below.” But Sodnam Gyaltsen was afraid. After some time, he looked and beheld the three provinces of Tibetbelow. Ganapati said, “Whatever you saw, you will reign over. You saw the three Tibetan provinces, so your descendants will rule over those territories. But because you didn’t look down the moment I told you to, you will not rule them yourself.” Then he placed Sodnam Gyaltsen on the earth again. For a long time Sodnam Gyaltsen had no son, and being sorely disappointed he performed special praises to Ganapati. At length Ganapati appeared at the dwelling of Saton Ripa and said, “Sangtsa Sonam Gyaltsen is constantly invoking me, saying that he needs to command the three provinces of Tibet . But no matter what practice he does, he does not have the karmic connection to rule them himself. Therefore a Bodhisattva who has accumulated much merit and would be able to dominate the vast world must take birth as his son. You, Saton Ripa, possess these qualities, so please take rebirth as Sonam Gyaltsen’s son with the aspiration to help all Tibetan people, particularly those in the three provinces.” Saton Ripa agreed, and was later reincarnated as the child who became Chogyal Phagpa. At the age of three, Chogyal Phagpa recited the elaborate Hevajra sadhana known as Druptap Tsokye (Lotus-Born) by memory. Everyone present was astonished and remarked, “There is no doubt that he is a true Phagpa (holy being)!” From that time on, he was known as Phagpa, and his fame was proclaimed far and wide. At the age of eight, Chogyal Phagpa recited the Buddha’s life story. At the age of nine, while his uncle, Sakya Pandita, was turning the wheel of the Dharma, Chogyal Phagpa recited the second chapter of the Hevajra Root Tantra from memory. He also gave a profound public talk at a Dharma gathering. There were many scholars and other learned ones, yet they were all humbled by his knowledge and praised his natural good qualities and wisdom. At the age of ten, Chogyal Phagpa journeyed to the area north of Sakya where Sakya Pandita was Abbot and Master of Ceremonies. Chogyal Phagpa received novice monk’s vows from Sakya Pandita, and then received instructions in the Vinaya rules and precepts from the Abbot of the Chormolung, Sherab Senge. 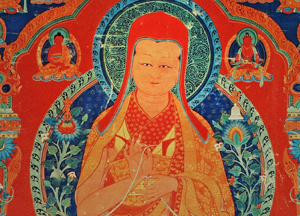 By the time Chogyal Phagpa was seventeen, Sakya Pandita had transferred to him all of his own teachings, good qualities, and responsibilities, and was very pleased with him. Seeing that Chogyal Phagpa had the ability to carry on his own holy activities, Sakya Pandita gave him his Dharma conch shell, alms bowl, and other religious objects. He also gave him the responsibility of leading his disciples, saying: “Now it is time for you to carry on the holy activities of spreading Lord Buddha’s doctrine and working for the benefit of all sentient beings. Know that you made this commitment in previous lives.” So saying, Sakya Pandita transferred to Chogyal Phagpa responsibility for maintaining the doctrine. In the Year of the Ox, Kublai Khan, the Emperor of China, invited Chogyal Phagpa to his palace and asked him many questions that others could not answer to his satisfaction. 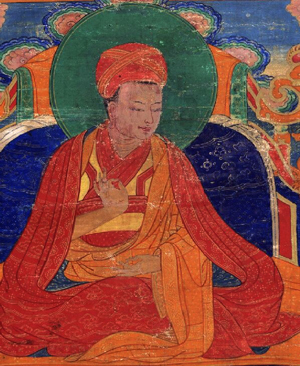 Chogyal Phagpa responded with such logic and reasoning that the Emperor was pleased. Later, the Emperor proclaimed that he would send tax collectors to Tibet and draft its citizens into his army. Chogyal Phagpa repeatedly urged the Emperor against this course of action, saying, “ Tibet is a small country and located far to the west. It hasn’t much land, lacks material resources, and has a sparse population. The country is unable to sustain taxes, and does not have enough citizens to man your armies. I beg you not to require this of them.” But the Emperor was adamant, and Chogyal Phagpa became discouraged. The Empress said, “When I came to the court, my family gave me these earrings which are the most valuable part of my dowry. Normally, I never remove them from my ears, but I will now offer one to you.” So saying, she removed a large pearl from her ear and offered it to Chogyal Phagpa. Later, he sold it to a Mongolian merchant for a large measure of gold and one thousand measures of silver. When he ultimately returned to Tibet , he offered a part of these to a large gathering of the sangha at Tsang Chumig. With the remainder, he built a golden pagoda atop the Sakya monastery. After the Empress received the Hevajra Empowerment, she told Kublai Khan, “The Dharma which I received is profound and extraordinary. You should receive it, too.” The Emperor then requested Chogyal Phagpa to give him the empowerment. Chogyal Phagpa said, “After receiving an empowerment, one should venerate the guru who bestowed it and seat him on a throne higher than one’s own. With one’s body, one must prostrate to him; with one’s voice, one should follow whatever instructions he gives; and with one’s mind, one should not go against the lama’s intent. You may not be able to do these things.” The Empress suggested, “When the Emperor receives empowerment with a small gathering of his inner circle, he will seat the Lama on a throne higher than his, but when there are public gatherings, he should sit upon the highest throne to preserve the hierarchical tradition. Also, regarding activities related to Tibet, the Emperor should not give orders to the Tibetans without first consulting with the Lama. Regarding other decisions, they should be made by the Emperor in consultation with the Lama because the Lama has the nature of great compassion. However, because some people might take unfair advantage of the Lama’s kindness he, in turn, should confer on all decisions with the Emperor. Chogyal Phagpa agreed to these conditions. Then Chogyal Phagpa bestowed on the Emperor of China and twenty-four members of his retinue the complete Shri Hevajra empowerment, which is unique to the Sakya tradition. In this way, the Vajrayana began to be established in the lands of China and Mongolia . In appreciation for receiving this empowerment, the Emperor made Chogyal Phagpa an offering of thirteen groups of ten thousand subjects each. The Emperor’s second offering consisted of a famous, holy conch shell known as Chudung Karpo Jangdrak (Holy White Conch Shell). The Emperor also offered the religious communities and lay inhabitants of the three provinces of Tibet . The three provinces of Tibet comprised the following: the territory starting from the three Ngari regions of west Tibet up to the Sogla Kyawo Pass (Gray Pass of the Sog Region), which is known as the Holy Dharma province; the territory from the Sogla Kyawo down to the Machu Khugpa River (Mekong River) which is known as the Human Province; and the territory from Machu Khugpa River to Ja Chorten Karpo (White Stupa of China) which is known as the Horse Province. During Kublai Khan’s reign, his kingdom encompassed eleven shings of which the three provinces given to Chogyal Phagpa were counted as one shing. In reality, the three did not have enough inhabitants to qualify fully as a shing, but since it was the land where the Emperor’s teacher resided, and since it was a place where Dharma became widespread, it was counted as one shing. “The elements of the sky are as red as blood. The corpses of the flat footed ones fill the oceans. The virtue of stopping such acts. Thus, the Great Lord of Dharma, Chogyal Phagpa, was venerated by the Emperor as a supreme teacher. Chogyal Phagpa replied, “If I can help the Emperor establish solid faith and maintain the samaya, I will grant your request. In the Vajrayana, it is said that if at a crucial moment, a teacher fails to fulfill the wishes of his student, he is committing a great fault. Therefore, bring me a sharp sword from the armory and ask the Emperor and his ministers to come watch while I perform a miracle. The Empress did as he requested. When they had gathered, Chogyal Phagpa addressed the assembly: “Now I will bless my limbs as the five Dhyani Buddhas. All of you assembled here, make aspiration prayers to be reborn in whichever pure realm you wish.” So saying, Chogyal Phagpa cut off his head, arms, and legs which then transformed into four Dhyani Buddhas, and his head become Mahavairocana. Then the Emperor, Empress, and ministers did prostrations and circumambulations, and made aspirations, each according to his capacity. While performing circumambulations, they noticed that Chogyal Phagpa’s torso, which was still on the throne, was bleeding. Seeing this, the Emperor and Ministers cried and begged that he return to his former shape. Finally, Chogyal Phagpa reappeared in the form of a lama as before. Later, many great scholars and well-accomplished mahasiddhas visited China and performed various miracles, but the Emperor thought, “Though these are amazing demonstrations of great benefit to sentient beings, no one can exceed the good qualities manifested by our great teacher, Chogyal Phagpa.” From that day he had no further doubt about Chogyal Phagpa’s realization. When Chogyal Phagpa was 19, he bestowed an empowerment upon Kublai Khan during the New Year celebration of the Female Water Ox Year. At this time, the Emperor offered his teacher the title of Tishri (Emperor’s Teacher). He also offered Chogyal Phagpa a seal made of jade which bore the letter sa with designs of jewels. Additionally, he offered gold, a Dharma robe adorned with pearls, a hood, shoes, a golden throne, a canopy, a tea set, and camels and mules bearing saddles decorated in gold. He also offered the subjects, provinces, and conch shell described above. At one point the Emperor told Chogyal Phagpa, “All Tibetans should follow the Sakyapa tradition. No other sect should prevail. Let us make this a rule.” Chogyal Phagpa replied, “We must help beings to follow Buddhism, each according to his own tradition. It is not proper to forcibly convert beings.” From that time onward, the Emperor and his teacher determined that those traditions that already existed should continue to progress in their own way. Thus both Emperor and teacher demonstrated their compassion and proper use of authority. Through the kindness and accomplishments of Chogyal Phagpa, all living beings in the region north of the Land of Snows found peace and happiness. The Dharma Lord, Chogyal Chogyal Phagpa, the teacher who brought benefit and peace to many parts of the world in general and to Tibetin particular, taught the Dharma in many languages and spread the Buddhist doctrine throughout the land. Will benefit beings in India and China . With the name of Chogyal Phagpa. Chogyal Phagpa performed these activities as prophesied. On the fifteenth day of the fifth month of the Female Wood Rabbit Year, Chogyal Phagpa took full monastic ordination from the Nyethang Abbot, Dragpa Sengge, at a place on the Chinese-Mongolian border known as Thele, on the banks of a large river. He also received Prajnaparamita teachings from him. From the Master Sonam Gyaltsen, he received teachings on the vinaya and pratimoksha. 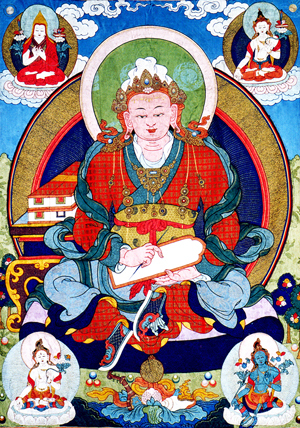 From Changchub Gyaltsen Yarlungpa, he received many teachings in logic, such as the seven categories of the Pramana. After this, he embarked on a program of detailed personal study. Have now been given the breath of life through your holy words. Treasure of Compassion and Master of Wisdom. With this homage, he wrote the verses of the inner offering known as Thupa Gyatso. Later, Chogyal Phagpa also created a written script for the benefit of the Mongolian people who had previously had none. As a token of appreciation, the Emperor gave Chogyal Phagpa the Bhande Shet Kyedma, or authorization to rule over the three Tibetan provinces. The text of this decree was woven into silk brocade. Chogyal Phagpa then turned the Wheel of Dharma in the Emperor’s palace. Many learned Chinese masters, who were followers of the teacher Tashing Lachen, attended these Dharma gatherings. They were strongly attached to their own tradition and view. The Emperor, foreseeing that they would distort the pure Buddhist teachings, asked Chogyal Phagpa to enter into debate with them and defeat them. He then selected seventeen of the most learned masters of that tradition and set a date for the contest. Chogyal Phagpa defeated all of them, placed them in the right view, and established them on the Buddhist path as ordained monks. In the Female Wood Ox Year, Chogyal Phagpa, then aged thirty one, returned to Sakya. There he built a stupa known as Tashi Gomang (A Multitude of Auspicious Doors), encrusted with many precious gems and containing the deities of Vajradhatu. The stupa was placed inside the Golden Pagoda Shrine. In addition, he restored the stupas of the previous founders of the Sakya Order, placed canopies atop each, and a golden roof above. He also built an immense gold-plated, copper Dharma wheel. Inside the monastery, Chogyal Phagpa sponsored the writing in pure gold ink of over two hundred volumes of the Buddha’s teachings, including the sutras, tantras, and Prajnaparamita. He also turned the wheel of Dharma on many occasions before large assemblies who he brought to spiritual maturity and liberation. 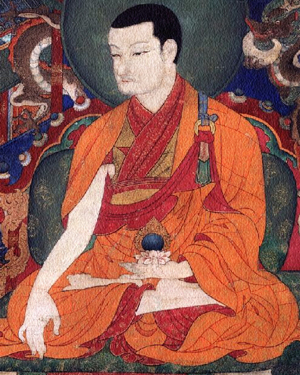 Although Chogyal Phagpa had completed his education and was a Lord of Dharma, he had no conceit. In order to strengthen his devotion to Dharma, he continued to rely on a variety of spiritual teachers. From some of them, Chogyal Phagpa learned Theravada teachings, from others, Mahayana teachings, and from yet others, Vajrayana. In short, he learned nearly all the Dharma which existed in Tibet at the time, including the five major Buddhist sciences, the Tripitaka, the four classes of tantra, and all the treatises related to sutra and tantra. He also received the empowerments, blessings, instructions, and pith instructions, including their supplements. In this way, he worked with great diligence and dedicated all that he had for the growth of the Buddhist doctrine and the benefit of all sentient beings. In the Female Fire Rabbit year, at the age of thirty three, Chogyal Phagpa again received an invitation from Kublai Khan to return to China . At the age of thirty three, Chogyal Phagpa set out for China with a large entourage. On the way to China , Chogyal Phagpa gave countless empowerments and instructions to many fortunate disciples, placing them in the state of maturity and liberation. He was like the sun surrounded by brilliant light rays, or like the moon surrounded by countless stars. When Chogyal Phagpa arrived in China , the was honored by a ceremony which was attended by the Emperor’s eldest son, his wife, and many ministers amidst a large gathering. Chogyal Phagpa was seated upon an Indian elephant adorned with jewels. To his right and left were many victory banners, countless musicians playing instruments, and lavish offerings. Chogyal Phagpa gave countless vast and profound Dharma teachings through which the doctrine of Buddhism arose in China like the sun in the morning sky. The following year, the leader of the Sakya region, Shakya Zangpo, laid the foundation of the Lhakang Chenmo. He and another leader, Kunga Zangpo, were able to encourage the thirteen categories of ten thousand families to assist in completing the project. In addition, they built the Rinchen Gang Labrang, the Lhakang Labrang, and the Duchod Labrang. In the Male Iron Horse Year, when Chgyal Pagpa was thirty six, the Emperor of China requested empowerment. When he received the empowerment, he offered Chogyal Phagpa a six-pointed crystal seal known as the Sheldam Lingdrukma, similar to that owned by the King of Menyak. He also bestowed upon Chogyal Phagpa a decree of special recognition, saying, “You are the only son of the gods on earth and under heaven, an emanation of the Buddha, creator of the nation’s script, national peacemaker, great pandita who is most learned in the five types of knowledge, Imperial Preceptor, Chogyal Phagpa Tishri. Along with this decree he made immense offerings of precious things and materials including one thousand large measures of silver and fifty-nine thousand bolts of silk and other fabrics. Whenever the Emperor met Chogyal Phagpa, he offered him a special katag and a large measure of silver. The Emperor’s combined offerings during Chogyal Phagpa’s first and second visits to China yielded one hundred measures of gold, over one thousand measures of silver, over fifty thousand bolts of silk, and many other items. In turn, Chogyal Phagpa placed the entire Mongolian population on the Mahayana path and spread the Buddha’s doctrine like the sun throughout all of China . Chogyal Phagpa made preparations to return to Tibet , telling the Emperor that he would soon return to China . However as Chogyal Phagpa was setting off, the Emperor had a vision that his teacher would not long remain in this world. As a result, both the teacher and the emperor suffered greatly at their parting. For this reason, Chogyal Phagpa’s progress in leaving China was slow, extending to weeks, months, and years. Arriving in the foothills of Mount Pomralha near the Yellow River , the Emperor and Chogyal Phagpa took final leave of one another. Just before parting they stayed together for a time like the sun and the moon, surrounded by the Emperor’s retinue of four divisions of the army and over one hundred thousand civilian followers. The Emperor made immeasurable offerings, gave a splendid farewell reception, and accorded Chogyal Phagpa the highest possible veneration. At that time, many auspicious signs appeared on the earth and in the heavens. A white cloud shaped like an elephant’s trunk extended toward the earth from the south east. Upon this cloud clearly appeared Mahasiddha Virupa, the Master Sachen Kunga Nyingpo, and many other Indian and Tibetan lineage lamas, surrounded by Buddhas and Bodhisattvas. These signs were clearly perceived even by ordinary beings. It is also said that many other auspicious signs appeared that Bodhisattvas were performing benefit for beings in other realms of existence. Through the blessings of the holy body,voice, and mind of the Master Chogyal Phagpa, whose real name is Lodro Gyaltsen Palzangpo, most of the subjects of the Mongolian emperor had the seeds of white deeds planted in their minds. They attained higher rebirth through pure aspirations, and solidly trusted the Dharma in three ways through which they were placed on the path of liberation, and guided toward the unsurpassable state. In the Year of the Rabbit, at the age of forty-one, Chogyal Phagpa arrived at his seat, the Sakya Monastery, with a large retinue. Many learned masters of U and Tsang joined him, along with the leaders of nearby regions who wished to receive teachings and advice. 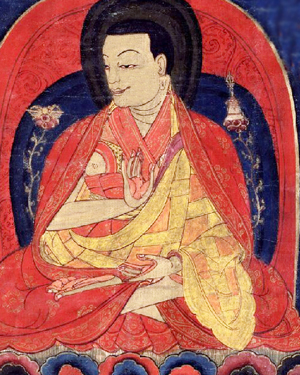 Because Chogyal Phagpa’s renown had spread as far as India, Kashmir, and other lands, panditas from these countries also began coming to Sakya to receive his teachings because he had received virtually all of the major and minor teachings of sutra and tantra, which had come to Tibet from India. Without withholding anything, he gave countless vast and profound Dharma teachings according to beings’ needs, and he also helped many sentient beings with vast material gifts. In this way he worked day and night at the Sakya monastery to benefit everyone. In mid-Spring of the Female Fire Ox Year, the Lord of Dharma, Chogyal Phagpa, turned the wheel of Dharma at Tsang Chumig Ringmo. One of the Emperor’s sons sponsored this teaching. During the teachings, Chogyal Phagpa honored over seventy thousand monks by giving each of them generous food offerings, a gold coin, and one bolt of woolen cloth for their Dharma robes. Besides the monks and nuns, many thousands of highly learned Dharma masters were also present. Counting ordinary beings, the crowd exceeded one hundred thousand people. Chogyal Phagpa bestowed an extensive turning of the vast and profound wheel of Dharma for over fourteen days. On one of the days, he bestowed the Mahayana Bodhisattva Vow, to over one hundred thousand people, planting in their minds the seeds for reaching unsurpassable enlightenment. On that day, he also wrote a Dharma text known as Tentsi (Description of Teachers and Their Doctrine). A few days after the teachings started, early one morning, a soft rain fell. There then arose a great wind which completely blew away all the dust and dirt. This was followed by a shower of flowers mixed with snow and sleet which cleaned the ground and covered it with flowers. Everyone became aware of a pervasive scent of perfume such as they had never smelled before. When the crowd gathered in the morning, all saw that the sun was encircled by five layers of rainbows and that the sky was filled with celestial offerings. Eleven great masters possessing pure perception, and twelve ching sang also possessing pure perception saw Buddhas and Bodhisattvas emanating light rays inside the circular rainbows. The miraculous vision filled the whole of space. Simultaneously on the roof of the shrine hall, vast material offerings were arranged, a silk carpet was laid out, woven with Chogyal Phagpa’s hand, foot, and head prints. Chogyal Phagpa stood upon this carpet and made offerings to the Buddhas and Bodhisattvas as vast as those made by Samantabhadra, reciting the Petition to the Buddhas of the Ten Directions. Then in front of them appeared the eighty vidyadharas such as Nagarjuna, surrounded by the Mahasiddha Virupa on his right, and the Mahasiddha Padmavajra on his left, along with countless other vidyadharas, viras and dakinis completely filling space. The vidyadharas placed their hands on Chogyal Phagpa’s head, gave him Dharma instructions and prophecies about the future, commended him for his holy activities, and recited verses of auspiciousness. Many auspicious signs, such as rainbows and showers of flowers had occurred on each day of the teachings. On the fourteenth day, when the turning of the wheel of Dharma was completely accomplished. Chogyal Phagpa stood before the gathering and gave a detailed explanation of dedication of merit. Beginning early that morning, many particularly auspicious signs appeared. The chief scholar of the Narthang region, Chomden Rigdrel, had not bestirred himself to attend Chogyal Phagpa’s teachings because he felt very superior. However, he did read some of Chogyal Phagpa’s biography. On the fourteenth day of Chogyal Phagpa’s teachings he thought to himself, “If I don’t give some thought to Chogyal Phagpa’s activities, I will be guilty of ignorance because his spiritual power has greatly influenced both ordinary beings and learned masters. I should go and see for myself what manner of being he is and what he is doing.” With that in mind he changed clothes and started out for the teaching. Reaching Chumig, he found Chogyal Phagpa seated upon the Dharma throne amidst an ocean-like assembly of monks and lay men and women. He perceived that his body was adorned with the major and minor marks of perfection; his voice proclaimed the vast and profound Dharma with the combination of unborn sound and emptiness; and his mind rested in the multiple samadhi of bliss and emptiness. From that moment, Chomden Rigdrel’s mind was completely overwhelmed and he could think of nothing but Chogyal Phagpa’s power. When the teaching ended, Chogyal Phagpa explained the dedication of merit and ascended to the roof of the hall while the rest of the gathering remained in their places. Chomden Rigdrel himself smelled a delightful scent such as he had never experienced before. He went to Chogyal Phagpa’s personal quarters beneath the golden monastery pagoda and examined the inside and outside of Chogyal Phagpa’s shrine hall. Inside, near the top, were sixteen dharma thrones upon each of which five cushions were stacked. Extensive material offerings were also placed before them. Immediately, Chomden Rigdrel recalled the sixteen elderly monks he had seen on his way to the teachings and he thought, “Until now I have been ruled by my own conceit. In fact, this great master is not an ordinary being.” Feeling deep regret at not having attended the teachings, he thought, “I should erase all doubt about this great Lama from my mind.” At that moment the scent of perfume intensified and he beheld the Sixteen Arhats upon the sixteen thrones, with Chogyal Phagpa reciting the Seven-fold Prayer and making offerings to them. Feeling yet deeper chagrin, Chomden Rigdrel performed countless prostrations and confessed his fault. From that moment on, his mind became completely serene and devoid of pride. Ultimately, he became deeply devoted to Chogyal Phagpa and composed an elegant praise to him known as Tsangpa Drukdra (The Sound of Brahma’s Thunderbolt). Later in his life he was venerated by the Mongolian Emperor as a great scholar and received great offerings which were brought to Narthang by the Emperor’s messengers. In this way Chogyal Phagpa performed miracles inconceivable to ordinary beings. He also sponsored the writing of 115 volumes of scriptures in gold ink which he placed in the Do Kham Gang shrine, and fourteen volumes of sutras, also in gold ink, which he gave to Tagthog Zhemocher. At the Sakya Monastery he built a stupa for Sakya Pandita’s holy relics which was constructed like Tashi Gomang and made of gold. He placed the stupa inside a shrine hall and erected a golden pagoda atop it. These and many other holy activities he performed for the benefit of the doctrine. In short, though he daily received limitless material offerings from every direction, he kept nothing for himself, not even a portion the value of a sesame seed. Everything given him was either offered to the Triple Gem or distributed to the poor. 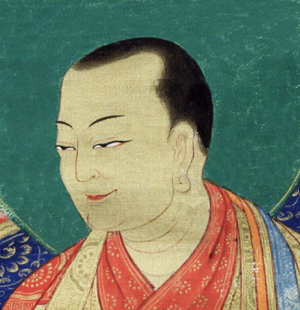 As a result, Chogyal Phagpa became one of the best endowed teachers in the history of Buddhism. During his lifetime he was offered six sets of the Kangyur, and he himself sponsored over 2,157 volumes of texts written in gold ink. The Mongolian Emperor twice offered him over one thousand large measures of silver, as well as gold and countless other offerings. All of these Chogyal Phagpa dedicated for the benefit of the doctrine and sentient beings. Chogyal Phagpa also benefited beings by preserving pure moral conduct, and served as abbot for 1,425 ordination ceremonies for monks and nuns. One of his chief disciples, Chokye Gompo, served as abbot for 947 fully-ordained and novice monks in one year alone. Through this master, his disciples and lineage, the ordination of monks and nuns spread throughout China , Mongolia , and Tibet . 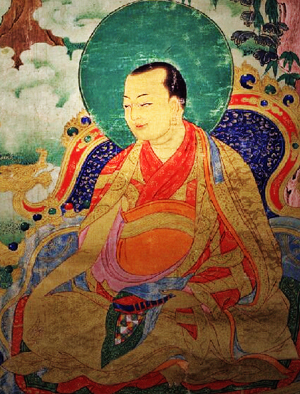 Outwardly, through the samadhi precepts, Chogyal Phagpa appeared as a scholar, performing learned activities such as teaching, debating, and composing. Inwardly, his mind never wavered from single-pointed concentration. As a result, he directly perceived a multitude of tutelary deities and experienced unbroken luminosity in his holy mind. These and other qualities are beyond description in ordinary terms. No matter what Chogyal Phagpa composed, it was pleasing to hear, easy to understand, meaningful and readily recollected by whoever heard it. His writings have remained popular to this day. In this way Chogyal Phagpa spread the precious doctrine of the Sugata in every direction like the rays of the sun. By teaching, composing, and engaging in debate, he produced innumerable disciples. If one tried to count all of his disciples in China and Tibet , it would be impossible. In short, during his lifetime and that of his chief disciple, the Buddha’s doctrine spread in a way which can be compared to its dissemination in India at the time of the Buddha himself. In his youth, Chogyal Phagpa had a dream one night in which he was holding a bamboo cane with eighty knots, the forty-sixth knot being crooked. When he related the dream to Sakya Pandita, the latter said it symbolized his life span. However, since the forty sixth knot was crooked, this indicated that obstacles would arise when he reached that age and that he would have to take precautions at that time. Thus, Sakya Pandita prophesied Chogyal Phagpa’s life span. Sakya Pandita also prophesied that when Chogyal Phagpa approached the time of entering into parinirvana, many celestial beings with clairvoyant minds, would enter into a state of mourning and depression. Many birds chirped discordantly and their feathers faded. Even the sun was not as bright as usual, ordinary humans felt unrest and indecision, and crops that year were poor. However, in his pure vision, Chogyal Phagpa saw that he was being venerated and given offerings by countless Bodhisattvas in Sukhavati, the realm of the the Buddha Amitabha, and many other Buddhafields. On the night of the third day of the tenth month in the Year of the Dragon, Chogyal Phagpa dreamt that he had reached Glorious Mountainin India where Master Nagarjuna was seated in front of an enormous Bodhi tree, and that he was listening to six different collections of Madhyamika teachings and many other dharmas. At the same time, many goddesses, most notably the Queen of Dharanyi Mahamaya (Great Peacock), clearly appeared in space and made countless offerings. These and many other auspicious signs appeared to him both day and night. At that point, Chogyal Phagpa commenced the annual anniversary offering to Sakya Pandita and continued to make great offerings throughout that month. His attendants asked why it was being held a month early that year, and he replied that “Although we generally start in the eleventh month, I made a commitment to perform it for a whole month every year, and I fear I might not be able to complete the ceremony if I were to begin making mandala offerings next month.” Thus Chogyal Phagpa presided over the offering ceremonies each day throughout the tenth month, continiuing until the eighteenth of the eleventh month. On the nineteenth, twentieth, and twenty-first of the eleventh month, he remained in his room. Early in the morning of the twenty-second he asked his attendants to arrange elaborate offerings. When they had done so, amid many auspicious signs, he took his vajra and bell into his hands and demonstrated passing into parinirvana. A rain of flowers fell, light rays pervaded the area, and celestial music was heard. Thus Chogyal Phagpa entered mahaparinirvana at the age of 46 in the Male Iron Dragon Year, in order to dispel the wrong views of those who cling to permanence, to demonstrate diligence to those who are lazy, and to benefit beings in other realms. At that time the earth trembled in six different ways in the Sakya region and delicious scents never smelled before pervaded space. Many other celestial offerings appeared. During his lifetime Chogyal Phagpa engaged in many activities such as preaching the Dharma, building great monasteries, and accepting both spiritual and political responsibility for the Tibetan people while traveling between China and Tibet . In this way he worked diligently for the benefit of the Buddha’s doctrine and for sentient beings. During the cremation ceremony, one of Chogyal Phagpa’s chief disciples, Dragpa Zhonnu, who is also said to be an emanation of Blue Manjushri, approached the site and strongly supplicated the guru with loud lamentations, beating his head against the stupa. While this was happening, a piece of charcoal flew out of the stupa. In it Dragpa Zhonnu discovered a relic of Chogyal Phagpa’s thumb, its surface bearing clear outlines of the Five Dhyani Buddhas as finely traced as though executed by an artist. Again, Dragpa Zhonnu supplicated the guru, placing the relics on his own head. After this, the designs on the relic became yet clearer so that even the faces and hands of the Buddhas could be discerned. Later, he placed this relic inside an image of the Buddha and kept it in a shrine in Shangdud Monastery. Abbreviated from a text in Sakya Dungrab Chenmo by Sakyapa Ngawang Kunga Sodnam. Translated by Venerable Lama Kalsang Gyaltsen and Victoria Huckenpahler.